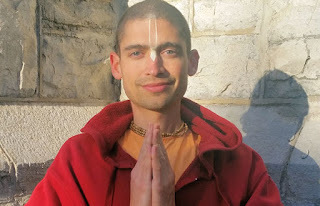 How I Became a Hare Krishna: Karuna Sindhu Dasa ~ The Toronto Hare Krishna Temple! The Toronto Hare Krishna Temple is featuring an ongoing series on our website about how active members of our community became practitioners of the Hare Krishna faith. Written by Krishna Rajesh, a young high school student in our community, this series will share devotees' personal stories of how they became Hare Krishnas! Please share your encouraging words and feedback with a comment! “Sankirtan” is the process of conducting outreach to those who may not know of the power of the divine names of Krishna (God). People mistakenly think that this movement, which was originally started by Sri Chaitanya Mahaprabhu (who is none other than Lord Krishna Himself), does not have a major impact in this world. But what they fail to understand is the deep and profound impact that it has on those who are involved and to those who are being reached out to. In fact, sankirtan is one of many outreach tools that have an impact! Every festival, every kirtan, every sanga, and even just the smiles that are given by devotees make a huge difference. Such, is the story of Karuna Sindhu Dasa and his journey to Krishna Consciousness. In 1994, Karuna Sindhu Dasa, then known as Kunal Benjamin Kugel, visited the ISKCON temple in Toronto for the first time. He had visited with a friend to eat at the restaurant known as Govinda’s. Struck by the ambience of the temple, Kunal immediately felt a connection. He was drawn to the vegetarian food and the high ceilings in the temple room. He was surprised to see how much things differed from the other Indian restaurants that he had visited. In 1996, Kunal had the opportunity to attend the annual Ratha-Yatra festival in British Columbia, Canada. It gave him a deeper insight of ISKCON’s values and he saw how devotees practiced Krishna Consciousness. Kunal then began to regularly attend the Sunday program at the temple, which was four hours away from his residence. He gradually began to make friends within the devotee community and he soon got involved with the temple in many events. As one thing led to another, Kunal was soon initiated and given the spiritual name, Karuna Sindhu Dasa. As you can see, Karuna Sindhu Dasa is one of the many jewels in the devotee community of ISKCON Toronto.